The final recommendation from the Great Movies – 100 Years of Film book for my viewing of The Wizard of Oz, is a bit of a swing and a miss. Combining Disney and Burton with a much beloved classic like Carroll’s Alice In Wonderland seems like an easy winner, but I was less than impressed. 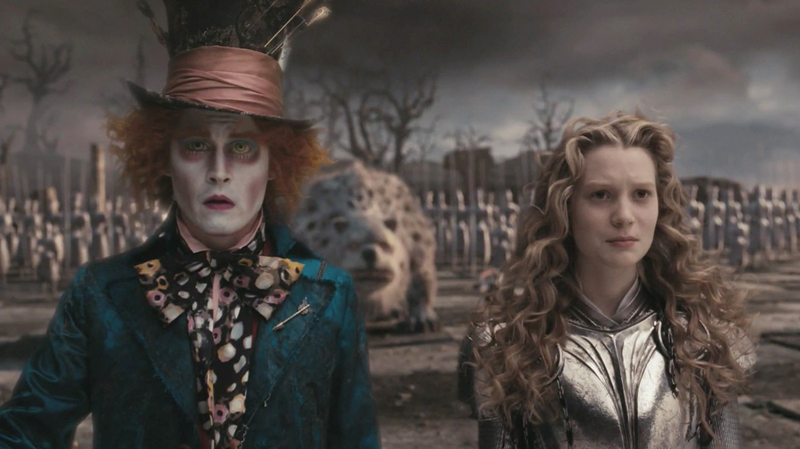 Setting itself up as more of a sequel than another live action retelling, Tim Burton’s CG heavy fantasy film sees Mia Wasikowska as Alice Kingsleigh, now 19, and believing that her trip to Wonderland, or Underland as it’s known, was nothing but a dream. Looking as gothic and ghostly pale, including sunken eyes, but it seems every woman in this film has the same style of makeup around their eyes, as you can in Victorian England, Alice is all set to be married off to Lord Hamish (Leo Bill). 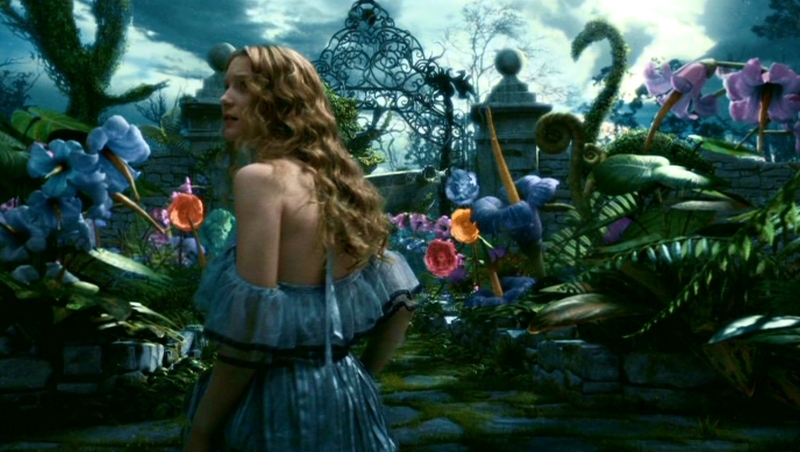 All eyes are on her, but she is distracted by a very familiar White Rabbit (voiced by Michael Sheen, who as far as I’m concerned NEVER works enough) and ends up tumbling down a rather large, and cluttered rabbit hole, which leads her down to Wonderland. There are quotes from the original stories that pop up on a regular basis throughout the film that is a nice touch, but it’s like someone at Disney thought they needed a property that could do for them what Lord of the Rings did for New Line (and Narnia couldn’t). The plot sees a prophecy foretelling that Alice will square off against the Red Queen’s (Helena Bonham-Carter) beast the Jabberwocky, something she doesn’t want to do. But through the course of her super-saturated computer adventure (honestly it was more like a video game than a film) she finds herself convinced to help by the words of the White Queen (Anne Hathaway) and an occasionally Scot-brogue spewing Mad Hatter (Johnny Depp). Considering the source material, and how much is there to explore and be faithful to, it’s sad that this was the route the film went (sadder still that there’s a sequel coming). While I am all for the proper use of computer generated images, I think it’s sad when they are all that’s used. It’s hard to buy into performances when the actors don’t even know what they are acting or reacting to. As much as I like Tim Burton, as much as I like Johnny Depp, I can categorically say that this one doesn’t work. Sure, I may not be the target audience, but you want a family/children’s film to be able to hold up to repeated viewings over the years, and that somewhere down the line, nostalgia will play a part in re-watching it… and you don’t want to be disappointed by it.